A settings window in SharePoint Designer provides configuration details and controls for a particular component of SharePoint Online. Components such as sites, pages, lists, libraries, and workflows all have settings pages associated with them. If you need to configure a list, for example, you don’t have to open the list in the browser and then navigate to the settings page. You can view and configure the settings for the list right from SharePoint Designer — in a settings window like the one shown for a Calendar list. When you first create a site by using SharePoint Designer, the initial screen that appears is the settings window for the new site. A gallery is a grouping of SharePoint artifacts displayed in a window. For example, when you click Lists and Libraries in the navigation window, you’re presented with all the lists and libraries on the site. Whenever you click any navigation button in the navigation window, SharePoint Designer pulls all the artifacts from the site for that navigation button (for example Content Types) into one grouping and displays that group in a gallery window. 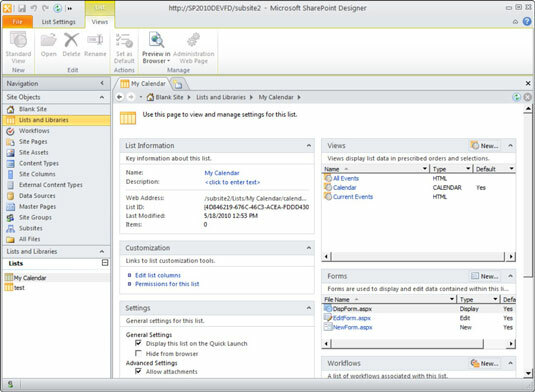 Each gallery has a corresponding SharePoint Designer Ribbon tab where you can find the commands specific to that gallery. For example, the Master Page Gallery has a Ribbon tab called Master Pages that offers functionality, such as creating, editing, and managing your site’s Master Pages.